It takes only a few steps in the iconic greeting card shop to be confronted by spooky displays although the Floppy Count Snoopula actually looks more cuddly than frightening. Still, the mysterious “Fortune-Telling Magic Mirror” and the grimacing “Scary Pumpkin Talker” are bound to stop you in your tracks. 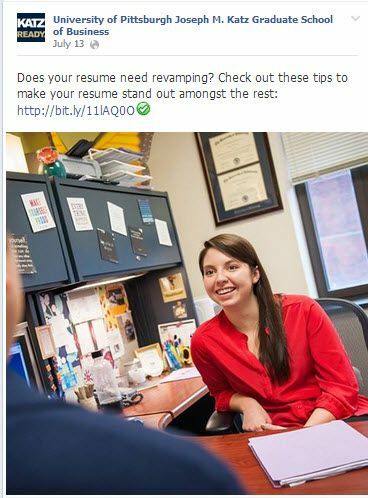 I don’t know if it was because I had just read the recent Forbes article, “Business Schools Social Media Ranking 2013- Do You Like, Follow and Subscribe?” but I started thinking of how business schools can grab prospects’ attention and strengthen engagement in their social media campaigns. 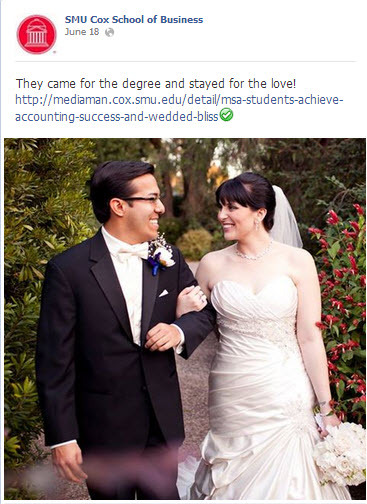 Like Hallmark, how can business schools stop customers (MBA prospects) in their tracks when they pull up their Facebook pages or Twitter feeds? 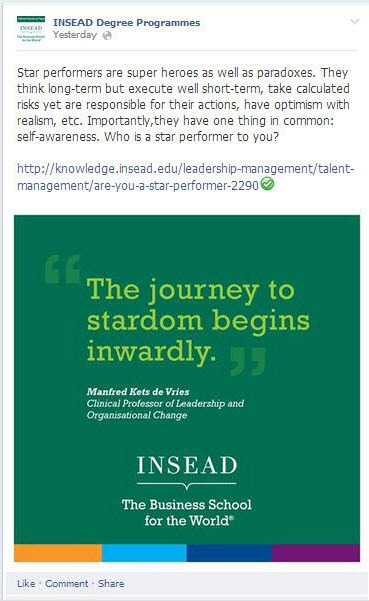 The Forbes article argues that business schools like Harvard and Stanford are leading the way on social media. It’s not all that surprising. After all, they are brand powerhouses. 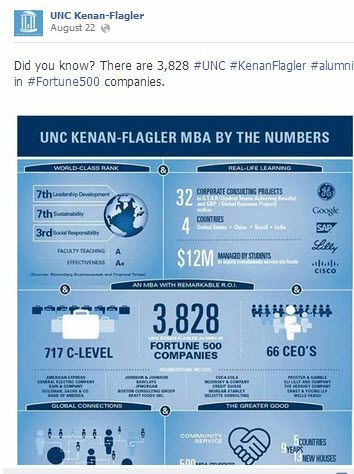 But what about all the other MBA programs out there – including smaller business schools with limited resources? 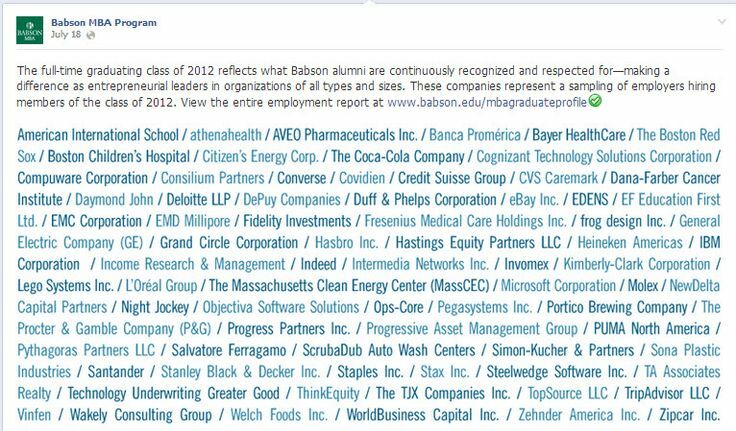 How can business schools attract an active following and engage prospects online? The real scary part of social media marketing is that there is so much information in news feeds these days that it’s difficult to stand out – especially when you have a few seconds to grab someone’s attention. Infographics are a great way to convey a lot of data in an easy-to-read and entertaining format. Check out this example below which stands out in a news feed. Also, note the use of hashtags to expand reach. Check out this article for more tips on how to optimize Facebook hashtags. 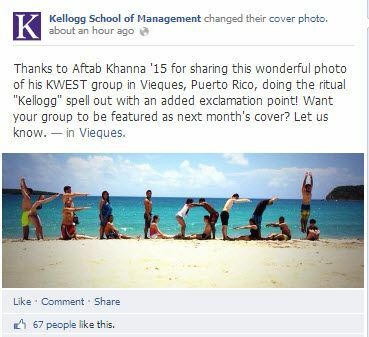 Increase engagement with fun contests like the one below. For added ROI, be sure to “tag” students in the photo for expanded reach. Research shows that photos on Facebook generate 53% more likes and 104% more comments than the average post. Note that this post follows another golden rule – keep copy succinct. In fact, posts of 80 characters or less get 23% more social interaction (comments, likes, shares) than the average according to this article in Social Media Today. 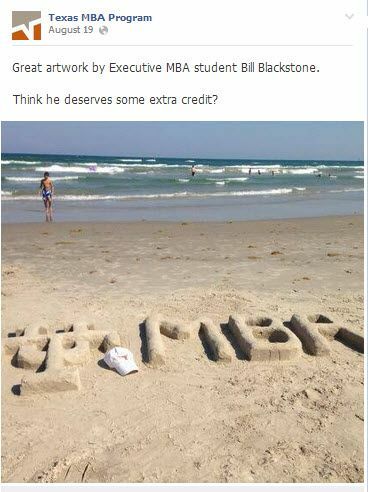 Here is another example of “thinking visually” to get noticed. Let’s face it. Academics may be the primary reason to apply to graduate school – but it’s not the only one. Enduring friendships are formed along with an extensive network. As this article points out, emotional engagement is the key to content marketing success. So, tap into the reader’s emotions through storytelling like this great example below. You could write a brief paragraph about all the services provided by your career office, but this list sums it up and makes a powerful statement. Notice the link back to the website for lead generation. It’s all about connecting through common language. This does the trick nicely. Capture attention in a busy news feed with bold colors and crisp messaging. Notice how the quote below stands out. 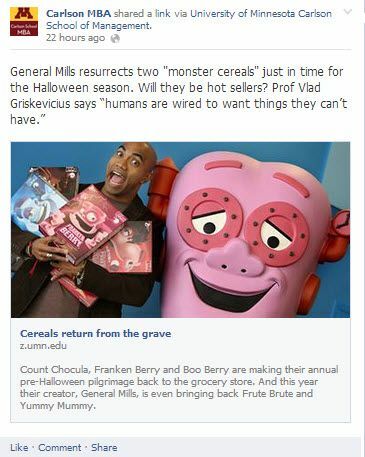 In our era of “humanized marketing” it’s all about showing the personality of the brand. Business school is serious business, but we can still present the knowledge and expertise of faculty in a fun and entertaining way. Doesn’t this make you want to sign up for his class? Provide proof points in a clever and enjoyable way. 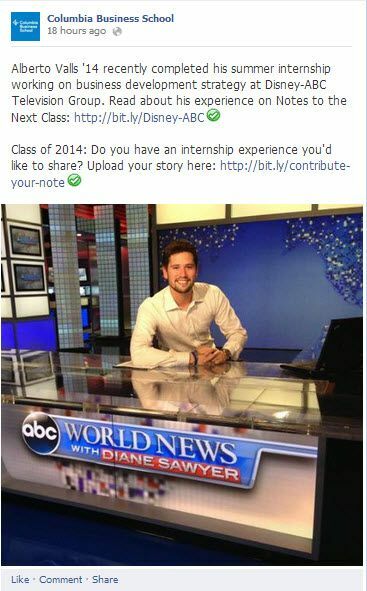 This photo of an intern at Diane Sawyer’s desk speaks directly to the benefits through one compelling image. Notice how the question at the end invites engagement, as well. 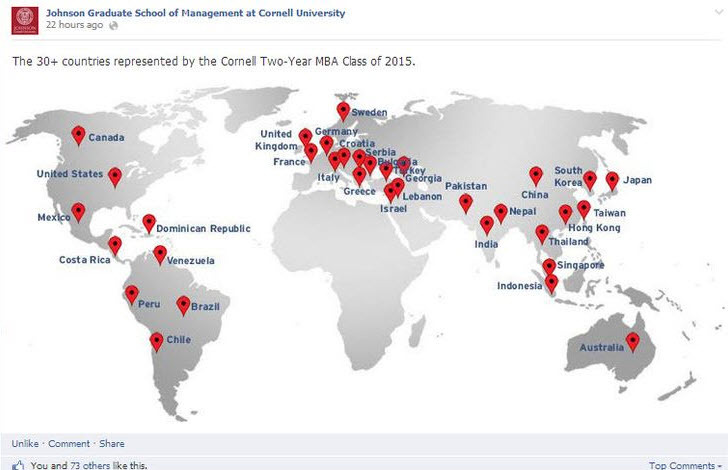 Not every business school can be located in the financial capital of the world or in Silicon Valley. 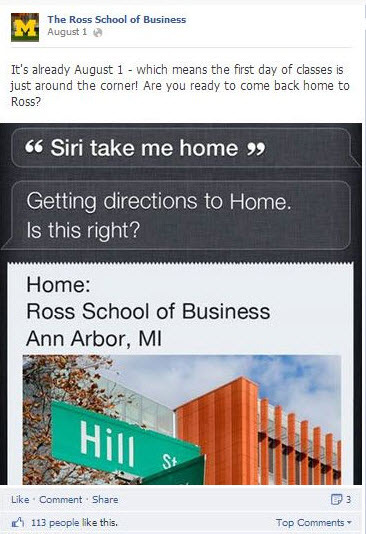 But that doesn’t mean that you can’t have fun with your location and promote the benefits. This captured my attention in my news feed. 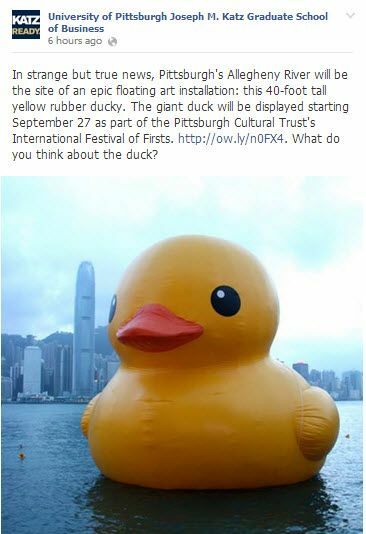 Who knew there were giant rubber duckies in Pittsburgh? Looks like a fun place to live and study. Note the question at the end of the post to draw readers into a conversation, too. Great tips and examples. Looking forward to exploring which ones I can adapt to our executive MBA program! Fantastic suggestions Barbara. Great article!